Chances are at least one of your Facebook friends has posted a screencap of cartoon cats playing with a ball, or has made a cryptic post about their frustration with someone called “Tubbs”. If you haven’t noticed, the animated cat collecting game Neko Atsume is taking over the internet.The premise of the game is simple: You have a backyard, and if you put out food and toys, cats will come visit you. When cats visit, they leave you fish, which can be used to buy better food and cooler toys to get more cats to visit. Some cats are easy to attract, and others will only come if you provide very specific items for them. The main goal of the game is to convince all forty-nine cats to come visit you. This game has appealed to people of all genders and age groups. Not only is it adorable (the cats even have little x’s for butts-come on! ), but it’s completely free, unless you choose to buy more fish with real money. One of the joys of this game is its simplicity. The goal is fairly obvious, and there are only so many things you can do to achieve it. There is a bit of strategy to it–deciding which items to buy, saving fish to buy big items versus buying smaller items as you go–but nothing that requires stressing over or major decision making. All of the cats come with a name, that you can change if you want. You can also choose which picture represents them in your Catbook. It also isn’t very time consuming. You have to wait for cats to arrive to get pictures of them for your Catbook, and then wait for them to leave in order to gain fish. The app doesn’t need to be running for these things to happen, so it actually benefits players to leave it be for a while before checking again. Unlike similar online games, there is no specific time frame you need to work in “or else” (remember Farmville?). Your cats won’t be mad if you don’t come back to see who’s in the yard. The only downside is you might run out of food, and the cats won’t return until it’s replaced. You only have to commit as much time and energy into the app as you choose, and there is no punishment for needing to take a break from it to go to work, or school, or bed. The only downside to this game is that you might drain your phone battery by repeatedly opening it to check on your cats. The game is free to download and doesn’t use data-you can even play it while your phone is in airplane mode. The cats are adorable, and you’ll quickly determine your favorites (Tubbs, for example, is a love him or hate him kind of cat). The game involves light strategy and patience, and is great for people who don’t have a lot of time to commit to something, or get anxious about high-involvement games. 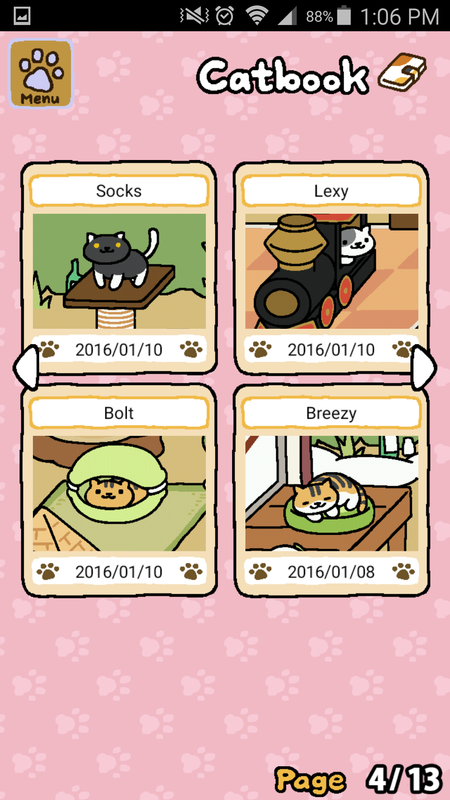 If you haven’t started your cat collection yet, try downloading the game and setting out some Thrifty Bitz. You won’t be disappointed.